TORONTO: Privacy curtains in hospitals can become breeding grounds for resistant bacteria, posing a threat to patient safety, according to a study. The research, published in the American Journal of Infection Control (AJIC), tracked the contamination rate of ten freshly laundered privacy curtains in the Regional Burns/Plastics Unit of the Health Services Center in Winnipeg, Canada. 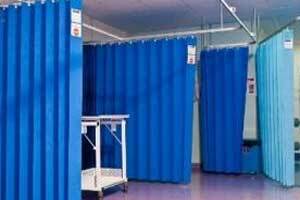 While the curtains had minimal contamination when they were first hung, the curtains that were hung in patient rooms became increasingly contaminated over time, the Association for Professionals in Infection Control and Epidemiology (APIC) said in a statement. By day 14, 87.5 per cent of the curtains tested positive for methicillin-resistant Staphylococcus aureus (MRSA), a pathogen associated with significant morbidity and mortality, the study found. In contrast, control curtains that were not placed in patient rooms stayed clean the entire 21 days, it found. None of the rooms where the curtains were placed were occupied by patients with MRSA. Four curtains were placed in a four-bed room; four were placed in two double rooms; and two controls were placed in areas without direct patient or caregiver contact. Researchers took samples from areas where people hold curtains, suggesting that the increasing contamination resulted from direct contact. “We know that privacy curtains pose a high risk for cross-contamination because they are frequently touched but infrequently changed,” said Kevin Shek, the study’s lead author. “The high rate of contamination that we saw by the fourteenth day may represent an opportune time to intervene, either by cleaning or replacing the curtains,” said Shek. By day 21, almost all curtains exceeded 2.5 colony-forming unit per centimetre, the requirement for food processing equipment cleanliness in some locations, such as the UK.